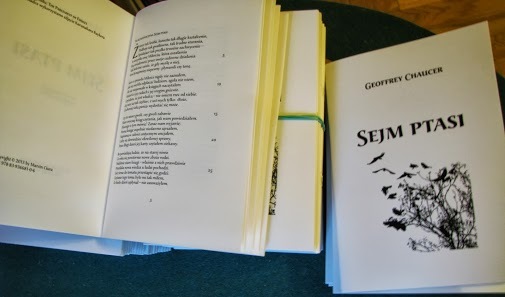 We learned this week about Marcin Ciura’s Sejm ptasi, a new translation into Polish of Chaucer’s The Parlement of Foules. Ciura, a computer programmer in Krakow, chose 16th-century Polish and a 13-syllable meter to give his translation a medieval feel. He has agreed to an “email interview,” so we will be back with more about the translation. For an early glimpse, see https://plus.google.com/+MarcinCiura/posts/93J9CQQtooC .